Solving a compound inequality means finding values for x that make the inequality true. 1) Enter the expression: 2x - 1 < x + 3 < 4. 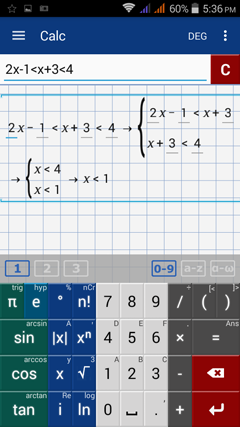 ​2) Enter the expression: 2(x + 1) < 3x - 4 > 2 by typing "2(x + 1) <= 3x - 4 >= 2." ​3) Enter the expression: 12 < x - 1 < 15. ​4) Enter the expression: x - 2 < 2x - 4 < 15 by typing "x - 2 <= 2x - 4 < 15." ​5) Enter the expression: 12 < x - 1 < 15 - 2x by typing "12 < x - 1 <= 15 - 2x."